Valentine’s Day is super fun for kids, and I know half that fun comes from the pile of sweets they get to bring home. But I’ve found that my kids get so much candy, they’re often more excited about non-candy gifts because they’re different than all the others. Last year I made a Valentine printable for heart shaped crazy straws that my kids loved, as well as another printable for cute superhero bracelets. 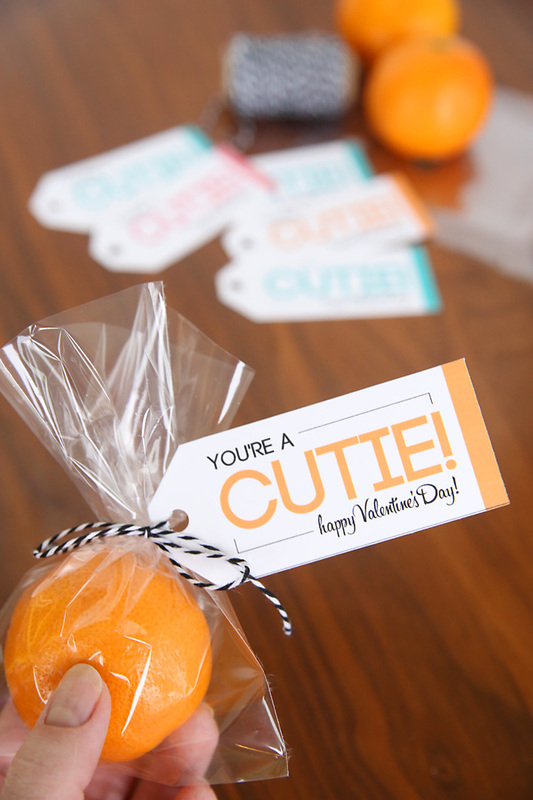 This year’s idea is another candy-free option: it’s a “you’re a cutie!” printable to hand out with adorable little cutie oranges that kids love. The tags come in three different colors, which you can download at the end of the post. All you need to do is print the tags on white cardstock at 100%. Then use a paper trimmer to cut the tags apart, and punch a hole in each tag. 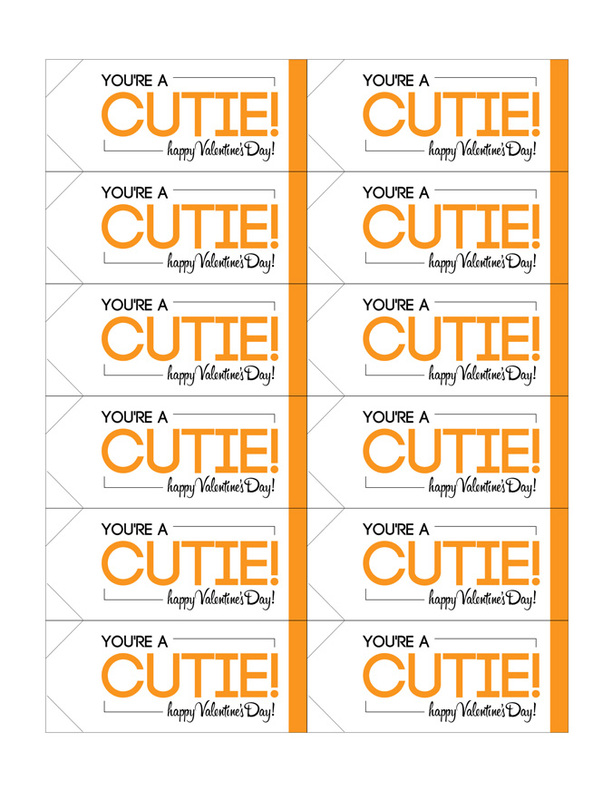 Click here to download the free printable Valentine tags in orange. Click here to download the free printable Valentine tags in pink. Click here to download the free printable Valentine’s tags in blue. Thank you so much for the adorable gift tags! I just love them. These are so cute! I might print these out and have my toddler take them to his friends! thank you. 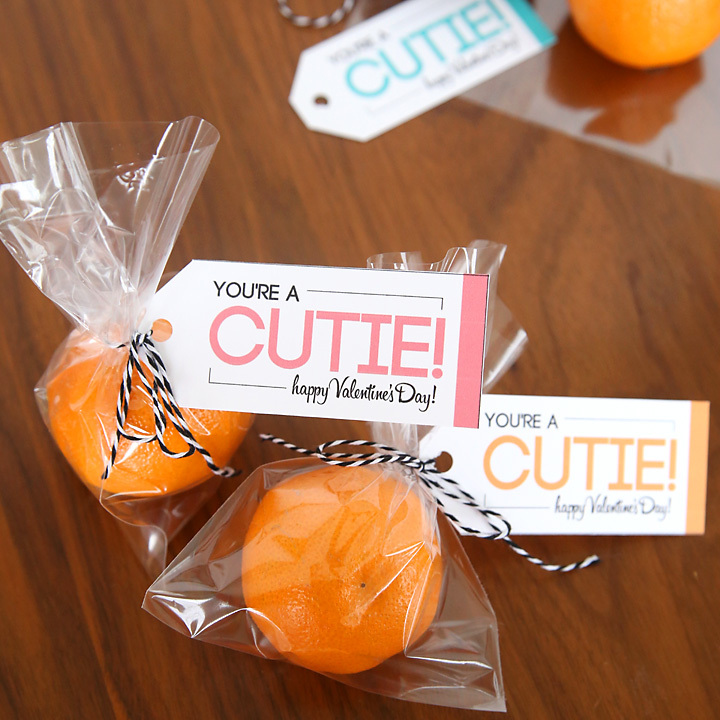 I am discouraging candy at Valentine’s day in class so the Cutie tags are perfect. Awe! This idea is so clever!!! I’m doing my best to help make my family healthier, and ideas like these are always welcomed!! LOVE LOVE LOVE THIS IDEA!!!!!! Thank you! This is such a good idea, giving fruit instead of sweets. My only though would be to use paper wrapping instead of a single-use plastic bag, as these are so bad for the environment. These Cuite tags are great. Awesome job! Thank you!